This entry was posted in Training & education on 2019/03/27 by Susan. Cardiopulmonary resuscitation (CPR) has saved the lives of many people in cardiac arrest. Now, a new tool makes it easier for people learning CPR to know if they are doing it correctly. 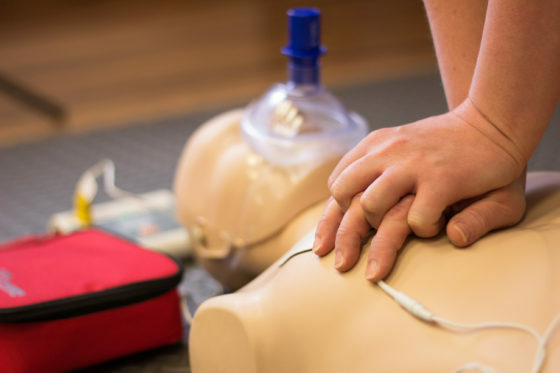 Traditionally, students practise CPR on manikins and rely on feedback from instructors who watch to see if they’re pushing hard enough and at the right rate. A recent research study explored whether wearable technology could help students get this feedback instead. The study, An Assessment of Wearable Feedback Devices for CPR Training, was funded by an Innovation at Work research grant from WorkSafeBC. It had students wear wristbands that measured their chest compressions using an accelerometer synced with their tablet or cell phone. Keith, who has been a first aid trainer for 20 years, partnered on this project with St. John Ambulance. He says numerous studies show that people can often be hesitant to do CPR. Even when trained, people can be reluctant to perform CPR — largely due to a fear of doing something wrong. That’s where devices like the wristbands can be beneficial. The pilot study did uncover one downside to using the wristbands in a classroom setting: it can be challenging for an instructor to monitor every student’s device at the same time. Keith and his fellow researchers have been talking with the device manufacturer about creating an on-screen dashboard for instructors to see everyone’s feedback at once. This idea sounds very beneficial to CPR training and I am very interested in hearing the outcome of this study.